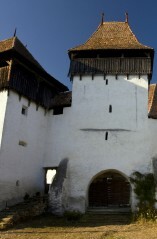 The Saxon settlers of Transylvania had a special status among the nations in the province and their civilisation managed to survive and thrive for over 800 years, starting with the 12th century. They formed strong farming, artisan and merchant communities. Located in the southern part of Transylvania, these settlements were constantly under threat from Ottoman and Tatar invasions. In order to protect themselves, the Saxons built fortifications of different sizes. The most important towns were fully fortified and the smaller communities created fortifications around the church. The fortifications were usually added towers and storehouses to safeguard the most valuable goods, often withstanding long sieges. More than 150 fortified churches survive until today (of the originally 300 built) – with a great variety of architectural styles, south-eastern Transylvania is home to the highest number of existing fortified churches from the 12th to the 16th centuries. Furthermore, a group of six Saxon and one Szekler villages are listed as UNESCO World Heritage Sites: Biertan, Calnic, Darjiu, Prejmer, Saschiz, Valea Viilor and Viscri.